Firstly, I’d like to apologize for the radio silence; its been a few weeks since my last entry. It’s not that I’m lazy, out of range of internet or being held captive. The lack of contact is due to one fact:a lack of good beer. So there I was, wandering a dry, desolate wasteland*, my tongue craving something hoppy, when a bright beacon appeared on the horizon. An oasis to save me from tasteless beer. I had found “Taps Beer Bar”. Located at 1 Jalan Nagasari in Kuala Lumpur, Taps is a little slice of heaven. Serving a great variety of craft beer from Australia, Europe, and the US, they have a bit of everything. I had found a home away from home. As soon as I arrived, I met Adrian, the friendly and very passionate owner of Taps. This man loves his beer. We sat and chatted for hours about beer, the craft beer scene, Australian beers, Australian politics… well, let’s just say I was there a while. The atmosphere at Taps was relaxed with some smooth, live music going on in the background, making it very easy to settle in and have a good conversation. Needless to say, I mistakenly had a few too many (more on that soon). 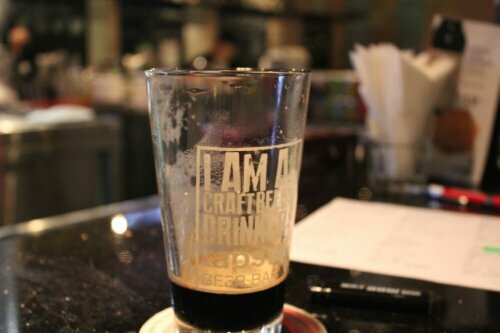 Adrian and Taps are on the forefront in Kuala Lumpur for pushing the craft message. From what he tells me, it’s slow going, but it is gaining traction. 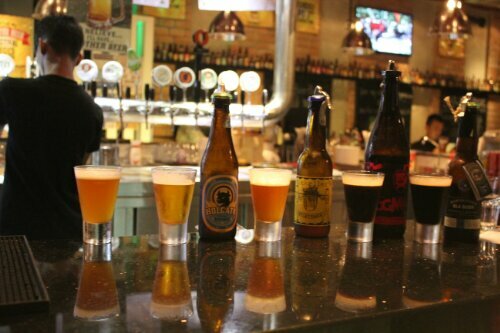 Malaysian’s still view beer as a poor mans beverage and changing that perception is hard. Taps runs events for International Beer Day and created their own Good Beer Day to try and get the word out and it seems to be working. What was a predominately expat customer base is slowly turning into a good mix of locals and foreigners. Now, as I mentioned, I had a lot of beer that night (and some honey whiskey if the fog of memory serves correctly). This caused me much headache the next day. For one, the missus gave me a good what’s-for for spending so much and not collecting her to join in on the frivolity, and second, the ACTUAL headache that KO’d me. Folks, if I can give one piece of advice, it’s this: if you plan on having a big night out in Malaysia, make sure your next day is planned as remaining horizontal in a nice, air conditioned room. To venture out in the heat with a hangover is not, repeat NOT, recommended. I’d like to thank Adrian for putting me in that position. If you ever find yourself in KL, be sure to stop in there. It’s an amazing venue with a great staff and top notch beer. You won’t be disappointed. I wish Taps Beer Bar nothing but success in their fight for the good fight and will be sure to be back. Can’t believe you’ve been to Taps! My in-laws live in KL, we visited in August and this was top of my to-do list, such a good little bar with a great beer selection. I’m off back to KL in 2 weeks for Christmas and have already warned the guys at Taps of my return! Taps is tops. Second favorite beer bar on this trip next to Pony in NYC. Enjoy!